C, D. I-95, exit 44. Massachusetts: exit 44. Park at Best Auto/Truck Stop, Peabody, Massachusetts (paid parking, $10.00/day; maybe able to get away free if not spending night?) Boston. By far the priciest excursion. Because it was our anniversary I cheerfully bent over and grabbed my ankles. Thirty bucks got us a pleasant cab ride from Peabody through winding, pleasant townships (or, maybe they were just well kept neighborhoods) to the train station in Salem (yes, the Salem, a tourist trap itself, as you might have guessed). Round trip fare from Salem to Downtown Boston was $14.50 each. Then we walked the streets. The sites are close, but not immediately apparent, so you might want to ask a local (they talk funny on the east coast, but I’ve never had to hire an interpreter). Then, we jumped back on the train to the Museum of Fine Arts. General admission was $23.50, which pencils out to be far less than a penny per brush stroke! Then back on the train to Boston, grab a bite at the food court in the Faneuil Hall Market Place (Quincy Market), back on the train to Salem, summons a cab to the train station, and back to the truck. I think we were spent, if I remember correctly. B, H. I-94, exit 30. Park at the Flying J. Lake Michigan, Dunes National Park. Follow these directions explicitly, at least at first. Or, else. If you go as the crow flies they may circle back and peck at your remains. Not quite that bad, but it’s sure a chore to get across town in a straight line (no bike lanes, or sidewalks). It’s quite a lake. It’s great. Riding close to the water, where the sand was wet and packed, I was able to get to St. Joseph. Between the two towns (Benton Harbor being the other) St. Joseph has more to offer. So, the directions. Go west on E. Napier, northwest on Pipestone road, west on W. Main street and then poke around until you find water. MB, B. I-77, exit 145. Park at Pilot. Cuyahoga National Parkis just around the corner. 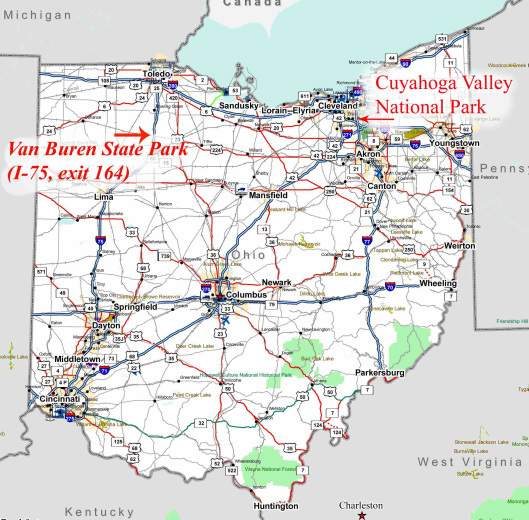 Cuyahoga Valley is pleasant, even pretty, but with no plunging canyon walls, or dramatically sculpted buttes it definitely gained entrance into the national park system based on the talent portion of the competition. And that talent was politics. It gained national park status by riding the“urban parks” wave of the seventies. Don’t get me wrong: if I can’t get near Slickrock, I’ll gladly ride Cuyahoga. Towpath Trail. I’m sure you’ve heard about them in your history classes. So, to get there head north out of the parking lot on Brecksville and ride 1.6 miles to Valley Parkway. And you’re there. Buckeye Trail entrance is about a third of the way down on the left. Or, alternately head north on Brecksville and right on Snowville and it leads to park headquarters (didn’t go, myself). Towpath Trail is down the length of Valley Parkway and across the river (which, navigating by memory and instinct, I missed completely).